"Reduce The Price Of Food. Reduce The Price Of Liquor. Widen The Roads." Brendan Behan, on his approach to writing: "I hope that it's easy going. 'Take the world easy and the world will take you easy.' I hope that it's anti-fascist. I'm against power in any sense or form. I think the people have to have some kind of society, I suppose, but I don't know, exactly. I'm not a politically-minded person. It's been proved to me over and over again. I suppose, eat better, drink older and better liquor, love their wives more and sort of, I hope, that people would be happier." 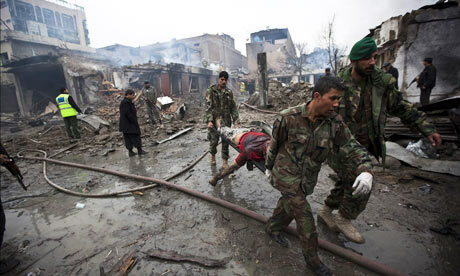 On This Day, The Birthday Of The Prophet: A Taliban Atrocity In The Streets of Kabul. "I am planning a short visit to Kabul to get things going between the 15th and 26th of February. We will plan 3 meetings together to discuss the new "production workshop" that we will have this year and coming year. It will be the same principle as "Children of Kabul", a series of 5 short documentaries about a common theme. We will first discuss this common theme. Then we will see what subjects within this theme each of you would like to propose. I will also have individual meetings with those of you who want to discuss their personal projects with me or show me a choice of rushes." - Severin Blanchet, teacher, filmmaker, friend of the Afghan people. He is among the dead from the Taliban's suicide bombing today in Kabul. Thomas Rutting was nearby. He asks: Where are their ‘Islamic’ credentials when they cause such an atrocity on Muhammad’s birthday, on of the holiest days in Muslims' calendar? I was in the Safi Landmark six days ago. The neighbourhood is, or was, thriving and pleasant. The Canadian documentary film-maker and photographer David Belluz was there today. Here is what he saw. Last week, my colleague Lauryn Oates had dinner with Belluz while Abdulrahim and I went off to meet with Rabbani. No flinching. No bowing down to terror. Our hearts go out to the victims and their families. We stand in solidarity with you. "We will leave for Banes, Holguin Province, Embarcadero road, house number six. . ."
I am Reina Luisa Tamayo Dangier, the mother of prisoner of conscience Orlando Zapata Tamayo who was interned in the hospital of the Habana del Este Prison. Last night he was moved to the Hermanos Ameijeiras Hospital where he passed away at 3:00 PM. I can tell you I feel a horrible pain, but I am holding on, enduring through this pain. I was able to be at his side until he passed away and now hope to have the courage to dress my son Orlando Zapata Tamayo. We will leave for Banes, Holguin Province, Embarcadero road, house number six, where we will hold the wake before our family altar, at my home, for as long as required. In the midst of deep pain, I call on the world to demand the freedom of the other prisoners and brothers unfairly sentenced so that what happened to my boy, my second child, who leaves behind no physical legacy, no child or wife, does not happen again. KABUL – At his massively fortified residence in this city’s posh Wazir Akbar Khan district, Berhanuddin Rabbani, the godfather of Afghanistan's warlord bloc, uttered a dire warning. Any "exit strategy" from Afghanistan that proposes a power-sharing deal with the Taliban could plunge the country back into the raging, fratricidal warfare that preceded September 11, 2001. Throwing his formidable weight behind the surging opposition to Afghan president Hamid Karzai’s backroom entreaties to the Taliban, Rabbani warned that any hint of political concessions to the Pashtun-based terrorist movement could provoke Afghans to take up arms against their own government. "There is a limit to the patience of the people. Beyond that limit, no one can be patient anymore." My report of our conversation appears in today's National Post, but it's the background to all this that is especially chilling. It's not just speculation about what might happen. The big story here is about what is happening already, and as always, pereption counts for everything in Afghanistan, and there is no intrigue like Afghan intrigue. No matter how well-intentioned, President Karzai's "peace at any cost" approach to the Taliban's counterrevolutionary insurgency is bonding the conservative leaders of Afghanistan's religious and ethnic minorities with some of Afghanistan's most progressive forces - women's rights leaders, human rights activists and pro-democracy reformers. The anti-appeasement revolt is directly related to an all-out, last-ditch effort to entrench a transparent, functioning and accountable democracy in this country, with Abdullah Abdullah, Karzai's front-running challenger in last year's fraud-plagued presidential election, digging in for the long haul. First, a bit about Rabbani and why it matters what he says. Now 70, Rabbani has seen Afghanistan's agonies from a singularly advantageous perch. As a young Tajik Afghan from the northern reaches of Badakhshan, Rabbani saw Islam as a way to escape the crushing grindstones of the Cold War. In the 1960s, he traveled to Cairo, becoming one of the bright young proteges of Egypt's Muslim Brotherhood. He was one of the first scholars to translate the works of Sayed Qutb, the grandpappy of Islamism, into Dari. It was Rabbani who led the U.S.-backed mujahideen alliance in its long and bloody resistance to the Soviet occupation of Afghanistan. At the helm of Jamiat-e Islami, Rabbani took over as Afghanistan's first post-Soviet president in 1992. But by this time the Americans had washed their hands of Afghanistan, and Rabbani was left helpless while the various mujahideen fractions, fronts and crime syndicates that he'd brought together ended up turning the country into an abattoir and an opium racket. Then the Taliban took over, and things got worse. Still formally president through the years of anti-Taliban resistance, Rabbani led the mujahideen "Northern Alliance" that drove the Taliban from Kabul in 2001. It was only with Rabbani’s blessing that Karzai clinched the presidency of Afghanistan’s interim government the following year. Largely untainted by the atrocities that blacken the reputations of several mujahideen commanders who ended up in Karzai’s original inner circle, Rabbani looms over Afghanistan’s powerful warlord bloc. He also chairs the legislative committee of Afghanistan’s parliament. To understand the urgency of Rabbani's warnings - and to understand why he's not just speculating about some possibly nasty future scenario - you'll want to notice three things. The first is the point raised by Niamatullah Ibrahimi, research officer with the London School of Economics' Crisis States Research Center in Kabul: "With these latest talks about negotiating with the Taliban, ethnicity is now the most divisive issue in Afghanistan." The second is Rabbani's reference to the conservative Pashtuns who form the emerging core of President Karzai's inner circle. While he wouldn't name names, Rabbani says Karzai's advisers include at least some of the authors of a 1999 tract that calls for the ethnic cleansing of perhaps half of Afghanistan's population, including Tajiks, Uzbeks, and the long-persecuted Hazaras, among the country's minority Shiites. The third is the key difference in President Karzai's recent enthusiasms about courting the Taliban. Until now, Karzai has enjoyed broad support for his proposition that Pashtun "sons of the soil" who give up the gun, renounce Al Qaida and accept the Afghan constitution should be welcomed back into the multicultural Afghan family. His latest initiative, which has won some support in western capitals, is an ambiguous package that could include even cabinet posts to Taliban leaders, and at the very least, would provide grants of money - and land - to Taliban fighters. During our conversation, Rabbani pointedly observed that President Karzai's previous "reconciliation" approach, partly bankrolled by Canada, served mainly to disarm anti-Taliban militias among the country's Uzbek, Hazara, and Tajik minorities. Rabbani says he is all in favour of "national reconciliation," but he fears something else entirely is going on. "If poverty is the only thing that creates insurgency, then why in Bamiyan and other provinces, there are many poor people living, but there is no insurgency? In the secure areas, they are not growing opium, and they are poorer. The obscure document Rabbani mentioned is known as Dozema Sacqawi, "The Second Water Carrier." Written under the pseudonym Samsoor Afghan - believed to be several authors - the Pashto-language treatise was in wide circulation in Afghanistan and Pakistan during the Taliban era. In May, 2001, journalists with the French television station TF-1 traced the publishers of Dozema Sacqawi to "a shadowy group of Pashtun nationalists living in Germany." The "Taliban manifesto" calls for for Afghanistan's Tajiks and Hazaras to be banished into the country's deserts, and for Pashtuns to be resettled with massive grants of land in Afghanistan's northern provinces, the heartland of the country's Tajiks, Hazaras and Uzbeks. The manifesto also calls for the rigid enforcement the Taliban's weird interpretation of the extremist Hanafi school of Sunni Islam. This should give you a glimpse of the reasons why Rabbani, among others, is a bit nervous about the motivations and the contents of any "peace at any cost" backroom deal the Karzai regime might strike with the Taliban. It should also shed some light on how it has come to pass that "peace talks" alarms are forging a rare anti-appeasement consensus across Afghanistan’s political class, uniting pro-democracy Pashtuns with former northern warlords, and women's rights leaders with Shia religious figures. Also, a series of events in recent days has boosted the opposition’s confidence that a sell-out is not just a potentially catastrophic idea, but an unnecessary one. Mullah Abdul Ghani Baradar, considered the second-in-command to the Afghan Taliban’s Mullah Omar, was recently arrested by Pakistani authorities with the help of U.S. intelligence. The British are leading a massive insurgent-clearing operation in Helmand province and it appears to be going quite well. Taliban leader Mohammed Haqqani, brother of the Pakistani Taliban leader Sirajuddin Haqqani, was killed along with three Al Qaida associates by a cross-border U.S. drone strike. About a dozen fairly senior Taliban figures have been arrested in Pakistan and Afghanistan in recent days. Afghanistan’s Parliament has been reduced to reading about Karzai's "reconciliation" schemes in the newspapers like everyone else, and now, President Karzai is engaged in an apparent end-run around the Parliament with a plan to oust United Nations representatives from the country's Elections Complaints Commission. It's understandable that after last year's election debacle, President Karzai would be busy with manoeuvres to shore up his support among conservative Pashtuns - the Taliban's support base. But add it all up and it looks a lot like a looming threat to the progress Afghanistan has made in women’s rights, democratic freedoms and social progress, and a dire threat to the delicate balance among and between Afghanistan's many ethnic and religious minorities as well. It was at a conference of more than 60 donor countries in London last month that Karzai surprised delegates with an announcement that his new reconciliation plan would require backing from the Saudi royal family and money from NATO-led International Security Assistance Force nations. The plan, which was a surprise to Afghan parliamentarians, too, would include a national “jirga,” or traditional assembly, to which the Taliban will be invited. The event is planned for this summer. Roaring up into the mouth of the Salang Pass in a beat-up old Toyota with Lauryn, Shuja and Parwani, we stopped at the river to take in a bit of the scenery and to get some air. I couldn't resist taking a picture of the some of the ubiquitous Soviet flotsam. We came upon this fierce looking bearded guy in a turban, carrying a long-barrelled shotgun. He was out hunting birds. He walked up to me bold as a bullock and kissed me on both cheeks and introduced himself as Assan Ullah. And a pleasant Salaam Aleikum to yourself as well, bubba, says I tae him. We doubled back and turned up the Panjshir Valley road. There's fish in the Panjshir River. I expect they will take a fly. We headed deeper into the mountains, the more sublime the further north we drove. Ancient mud-adobe flat roofed villages, goats and chickens, wrecked Soviet tanks at the side of the road, the wildflowers coming up among them all. Jinns in the mulberry trees, roses coming up, on up into the valley, to the Tomb of the Martyr, Ahmed Shah Massoud, the Lion of Panjshir. KABUL - In a wide-ranging conversation at his headquarters here yesterday, Abdullah Abdullah, Afghanistan's main opposition leader, warned of a complete collapse of the country if President Hamid Karzai does an end-run around Afghanistan's embryonic democracy and strikes a power-sharing deal with the Taliban. I report the substance of Abdullah's warnings in today's National Post. What follows is some further background. When Abdullah talks about a scenario far worse than the turmoil that was narrowly averted by the Canadian-led Elections Complaints Commission last year, he's not kidding. For now, Abdullah is counting on the world community to hold Karzai accountable and he's putting his sorely-strained faith in the rickety beginnings of Afghanistan's democracy, building a broad-based political party with a focus on political accountability, transparency and fully free elections. An informal coalition of women’s rights activists, secularists and democrats has also declared its unequivocal opposition to Karzai’s Taliban-talks plans. But the country’s ethnic Hazaras, Uzbeks and Tajiks also remember only too well the depredations of the Taliban, which is deeply rooted in the same rural Pashtun culture that provides Karzai with his most loyal supporters. “With these latest talks about negotiating with the Taliban, ethnicity is now the most divisive issue in Afghanistan,” Niamatullah Ibrahimi, research officer with the Crisis States Research Center here, told me. Afghanistan’s constitutionally-recognized Parliament, known as the Loya Jirga, has yet to be consulted about Karzai’s plans. “At least this should be shared with the Parliament, but we hear about these things from the BBC world news, like you do,” said Sabrina Saqib, an outspoken young Afghan MP. It's an elaborate masquerade, Abdullah said. “The government is shifting the whole focus to how we should bring the Taliban back. This is very dangerous.” Karzai’s broad hints about power-sharing will only give the Taliban more reason to simply wait it out while the world’s rich countries prepare to retreat. “The Taliban will not be willing to come in with the hypothetical situations of giving them ministries and governors and so on. They don’t want to be part of the political process. They want to destroy it and replace it with their own." Karzai insists that “reconciliation” benefits will be made available only to insurgents who accept the Afghan constitution and renounce Al Qaida. He says his new plan requires about $500 million in foreign contributions and a key mediating role by the Saudi royal family. Abdullah said he would support Karzai’s negotiation efforts if they were based on a strict insistence that the Taliban make the first move by renouncing violence and accepting Afghan law. “But the government of Afghanistan is causing confusion among the people of Afghanistan, and among its own friends. They’ve created this chaos, this fuss about it. What is it? Can anyone define it? For millions of people this is just a puzzle. What is it? Jean-Jacques Rousseau, Rene Descartes, Rosa Parks, Isaac Newton, Albert Einstein, Ali Akbar Dehkhoda, Immanuel Kant, Abraham Lincoln, Voltaire, Baruch Spinoza, Jawaharlal Nehru. These are among the faces you will find in oil-painting portraits on a wall of a classroom in Marefat High School, each carefully and thoughtfully painted by one of the high school's 2,800 students. They are Hazaras, Afghanistan's poorest people, the object of pogroms and persecutions, most brutally during the Taliban time. To get to Marefat High School from the western outskirts of the city of Kabul, you follow a long and winding road that heads up out of the Kabul plain, behind the shelled wreck of the Darulaman Palace. It doglegs and switchbacks into the foothills of the snow-covered Paghman Mountains, weaving a narrow passage through a Hazara city called Jabarhan. It is a place that confounds space and time - it is not found on any maps. It is hundreds of thousands of people living down narrow alleyways without electricity or running water, and their mud-brick, flat-roofed, close-quartered houses could be 1,000 years old, but none are more than a decade old. Its people are officially called Internally Displaced Persons. Officially, the place is called Police District 13. After about an hour, the narrow road jumbles its way into a neighbouring Hazara city called Daste Bachi - the Bache Desert - and this place, too, does not officially exist, and these alleys, too, are alive with flocks of sheep and chickens, and there are hundreds of thousands of people here, too. Hazaras are the people who take out the washing of the Kabulis in the plain below, and they sweep the streets of the city, and pull handcarts heavy with cauliflower and pomegranates. They are Shia of a kind, not Sunni. If you are a Hazara, you will know what it is like to extend your hand to a Pashtun, and to an Uzbek, and neither will shake your hand. You will know many such indignities. Marefat High School is supported entirely by the poor of Daste Bachi and Jabarhan. It is governed by a board of trustees elected by the parents, the teachers and the students. Last year, the school was attacked by a mob incited by Tehran's mullah in Kabul, Ayatollah Mohseni, from his gleaming, blue-domed madrassah down in Karte Se. The mob came screaming for Aziz Royesh, Marefat's short and stocky principal. The school is a dirty nest of Christians, communists and prostitutes, they shouted, there are boys and girls together, Royesh is an apostate, Royesh must die. "I was right here," Royesh told me, standing in the rutted and muddy alley outside the school. "The boys quickly locked the doors to the school, and I ran into my house, right there." I will be a chemist. I will be a doctor. I will be a journalist. I will be a businessman. How many Canadian soldiers are in Afghanistan? Does Canada make their soldiers come here, or can the soldiers decide? What do Canadians think about Afghanistan? If the Americans can see into our classrooms from space, why can't they find Osama bin Laden? Do you think Afghanistan will be rich like Canada one day? Does Canada like Afghanistan? A Bitter Cold Day In Kabul. KABUL - Not much to do at the moment but hunker down with a cup of tea, get acclimatized, and let the day go by slowly. Out to the old haunts tonight. This could have been a whole book about pirates. For much of the 17th and 18th centuries, Canada's Atlantic coast was seething with all sorts of seaborne blackguards, and indeed, The Island of Canada started out as a book about their exploits. There is for, instance, the astonishing story of the warlord Peter Easton, master of 1,500 men and an entire navy of pirate ships that he commanded from his fortified redoubt at Harbour Grace, Newfoundland. Easton once set out in his flagship, the Happy Adventure, at the head of a fleet of 10 heavily armoured vessels and captured El Morro Castle in Puerto Rico. . . The thing about the “Talking to the Taliban” is it’s a grand lark that works wonderfully so long as you pretend there are no real human beings involved. There are Dungeons and Dragons varieties and egghead editions, but you always have to supply your own suspension of disbelief. The downmarket version is like checkers: Troops out, then go back, do some deal with the Taliban, war is over. In this one only the bad guys can win. The best upmarket version is still the December, 2008 treatise by the scholar Barnett Rubin and the journalist Ahmed Rashid. Prepared for the U.S. Council on Foreign Relations, the Rubin-Rashid scenario has a surprise ending. Any peace will have to come at the expense of sharing power with the Taliban, and the troops don’t even get to come home. If they don’t stay, it doesn’t work. As for the latest version, which I take apart to see what's inside, in today's National Post, the Taliban’s lunatic one-eyed leader Mullah Omar already hacked its software when he sent a team of suicide bombers into downtown Kabul last month. Abdul Salam Zaeef, a former Taliban ambassador, says the main glitch with the new version is that there’s just nothing to discuss. Get these things backwards and it's the peace talks lobby you'll be backing, and you'll be serving Afghanistan’s reactionary status quo. You'll fancy yourself all "progressive" while you're supporting failed remedies first concocted by crazy right-wing U.S. Republicans, and you won’t even know it. I prefer the real world, in all its shabby and splendid limits and possibilities. I'm rushing off just now to the airport, headed back to Afghanistan, so posts around this place will be a bit sparse for a while. No Support For Amnesty International Until It Reinstates Gita Sahgal, Cuts Jihadist Ties. This has been going on for far too long. Now it's gone too far. To the embarrassment of its most principled supporters and against all internal entreaties, Amnesty International has persisted in whoring itself out to Cage Prisoners, a front for Taliban enthusiasts and Al Qaida devotees that fraudulently presents itself a human rights group. Today, AI relieved Gita of her duties. If you want AI's transparently subject-changing, point-avoiding non-explanation for its behaviour, you're welcome to it, here. For an account of the way Amnesty International started racing downhill with Islamist crackpots five years ago, Nick Cohen is, as always, indispensable. As Martin Bright points out in the Spectator today: "It is Gita Sahgal who should be the darling of the human rights establishment, not Moazzam Begg." Cage Prisoners' Moazzam Begg, a Taliban admirer who happily trotted off to Afghanistan when the Taliban ran the show, before 2001, is a former Guantanamo inmate and was a collaborator of the "Underpants Bomber" Umar Farouk Abdulmutallab back in 2007, when Umar was a UCL Islamic Society president (and is now the fourth former UCL Islamic Society president to face terrorism charges in as many years). Moazzam and Umar are both rather more than mere acquaintances of the American-born Yemeni Al Qaida cleric Anwar al-Awlaki, Umar's former teacher (and the Fort Hood shooter's former confessor, if you don't mind). Here's Moazzam chatting up Anwar, and Anwar thanking Cage Prisoners for all the help. Anwar's fatwas calling for the murder of Danish cartoonist Kurt Westergaard have not yet hit their mark, but it's been close. After Westergaard visited Canada late last year, a Canadian living in Chicago was indicted in a plot to kill him. Tahawwur Hussain Rana, along with his pal David Coleman Headley, are also facing charges related to helping plan the Mumbai rampage that left 166 people dead in 2008. And if Umar's own testimony to the FBI is to be believed, it was Anwar al-Awlaki himself who directed him to blow up that airliner on Christmas Day. All along, while Amnesty International brass has been promoting and servicing Begg and Cage Prisoners, Begg and Cage Prisoners have been promoting and servicing Anwar al-Awlaki. And that's not even the half of it. So, enough. Amnesty International has long depended upon the trust, the goodwill and the generosity of liberals, civil libertarians, and people of conscience from across the political spectrum who have been pleased to send AI their money. Those people should stop. Not a penny for AI until Gita Sahgal is reinstated and AI cuts all its ties to fraudsters like Cage Prisoners and Moazzam Begg. In the meantime, if you want to directly invest some spare cash to free people from slavery, and get immediate results, you will be happy to know that you can help free the women of Afghanistan from the dungeons of obscurantism and illiteracy. 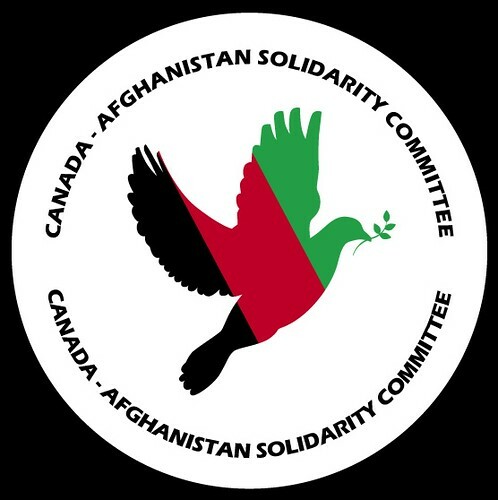 You can do that by supporting the work of Ehsanullah Ehsan and the Afghan-Canadian Community Centre in Kandahar. You can actually donate right now, without getting up from your computer, and the Canadian International Learning Foundation will even give you a tax receipt for your trouble. UPDATE: Christopher Hitchens weighs in here. "It's now incumbent on any member who takes the original charter seriously to withdraw funding until Begg is cut loose to run his own beautiful organization and until Sahgal has been reinstated." Also, a blog for Gita. And here Gita is interviewed on CBC from Vancouver. I want you to remember two names - Mohammad Reza Ali Zamani and Arash Rahmanipour. They were two young men who were executed by the Islamic regime of Iran at dawn this past Thursday, January 28 for the ‘crime’ of ‘enmity against god’. And whilst this act of barbarity will leave many of us outraged and ‘speechless’ (see writer Jim Herrick’s act of solidarity against the executions), we can only do them justice if we keep the pressure on. The Islamic regime of Iran is on its last legs and will do anything it can to maintain power just a while longer. It is flexing its muscles to intimidate and threaten and we need to flex ours. It plans to execute at least another 66 people that we know of in the coming weeks. - Maryam Namazie, Coordinator, Iran Solidarity. Not 'Peace Or War,' But To Betray Afghan Feminists, Secularists And Democrats, Or Not. You still wouldn't know it from the world's English language press, but the backroom agenda that found its way to London last week has been percolating for years, and its re-emergence was sparking an unprecedented revolt by Afghanistan's growing civil society movement. Long before last Thursday, Afghan secularists, women's rights leaders, and democrats were frantically raising the alarm. Only three days before the London conference, representatives from more than 200 Afghan women's rights and civil society organizations gathered at the Intercontinental Hotel in Kabul. After a day's deliberations, they released an eight-point consensus statement. The very first point: "Based on the persistent violation of the rights of women and men by the Taliban, whether when in power or after, objections were clearly and strongly expressed by all parties participating in this meeting regarding any negotiation with the Taliban." . . . For several weeks -- even in the Pashtun heartland, where the Taliban is entrenched -- progressives, socialists and pro-democratic parties have been attempting to raise the alarm of a looming sell-out, but their appeals have gone completely unnoticed by their erstwhile counterparts in the rich countries of the west. Last month, the Awami National Party and its allies among the traditional "Red Shirt" secularist movement gathered with several civil society organizations and the Amn Tehrik peace coalition in a two-day conference. The result was a comprehensive peace plan, the "Peshawar Declaration." Among its key recommendations: "NATO and ISAF are sent to Afghanistan under UN mandate. NATO and ISAF should stay in Afghanistan until terrorism is uprooted, foreign interference in Afghanistan must be stopped and the institutions of army and police are established on solid footings." In the tribal areas on the east side of the Pakistan frontier, last year's truce deals with the Taliban resulted in scores of school burnings, hundreds of murders and a reign of terror that has forced more than a million people from their homes. The Peshawar Declaration expresses support for the NATO efforts at a troop-withdrawal timetable to hand over security to Afghan authorities, but the half-dozen centrist and leftist parties that are its main authors are clear that appeasement of the Taliban will not work: "If the terrorists succeeded in Afghanistan their next target would be Pakistan. Therefore, this policy is destructive for Pakistan and should be abolished above board." Especially in the Taliban-infested districts of Waziristan and the Northwest Frontier Province, the ordinary people want Taliban sanctuaries destroyed: "These people do not support any peace deals with the militants," the declaration asserts. "It is the [U.S.] drone attacks which they support the most. . ."
This week, I managed to get away. The Things We Cannot Admit About Syria.